Ingrid and Gabby Waverly moved to France expecting a quiet reprieve from London gossip, but the truth they face in their new home has a sharper–and deadlier–sting. You know that happy thrill, that adrenaline rush, that runs straight from your head to your toes after the roller coaster ride has ended and you’re coasting back to the platform? That intense and jittery excitement that comes from the mashed up feelings of danger, terror, joy, delight and anticipation? That. That’s what I felt upon finishing The Lovely and the Lost. From beginning to end, it is one heck of a thrill ride, and just fun… if “fun” is the right description for a book filled with so many things that go oh-so-wrong for so many characters I’m emotionally invested in. While not usually a fan of stories/series with multiple third person narrators, this book (and series) is an exception. Morgan uses her storytellers and their different perspectives extremely well; running different threads parallel to each other, always keeping the larger story, the action, and the mystery moving forward at a breakneck pace. There were a few times when the transition from narrator to narrator was a bit jarring, but on the whole, the different perspectives effectively, skillfully, and continually serve to evolve the mounting tension and suspense. And oh, is there ever tension and suspense. Ingrid. Though not a fighter like her sister Gabby, Ingrid has grown tired of always relying on someone else’s protection. Slowly coming to terms with what she is, she desperately wants to learn how to control her Lectrux ability, so that she’s capable of protecting herself from those who would harm her. Romantically though, the girl is a bit of a mess. Her character torn between a boy she can never have and another who confuses her, frustrated me to pieces at times… and not always in a good way. Gabby. Fiery, confident Gabby is reeling from the injury that left her face scarred. She’s become a little more self-conscious and uncertain, determined to prove that she’s still relevant and valuable. It’s a bit tough watching Gabby struggle through this book, honestly, but I love the direction Morgan is taking her character. Grayson. Last book, Grayson was more the objective and our inside peek at the villain. And because he was all muddled and not really himself, the reader didn’t really get the chance to know the real Grayson. So, I love that we get to see more of him this book, and I found his perspective and his inner turmoil to be some of my favorite character bits. Overall. 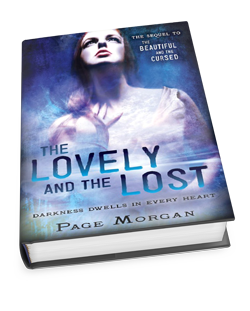 The Lovely and the Lost is a thrilling and impressive sequel, and I cannot wait to see where Morgan takes the story and the characters next.